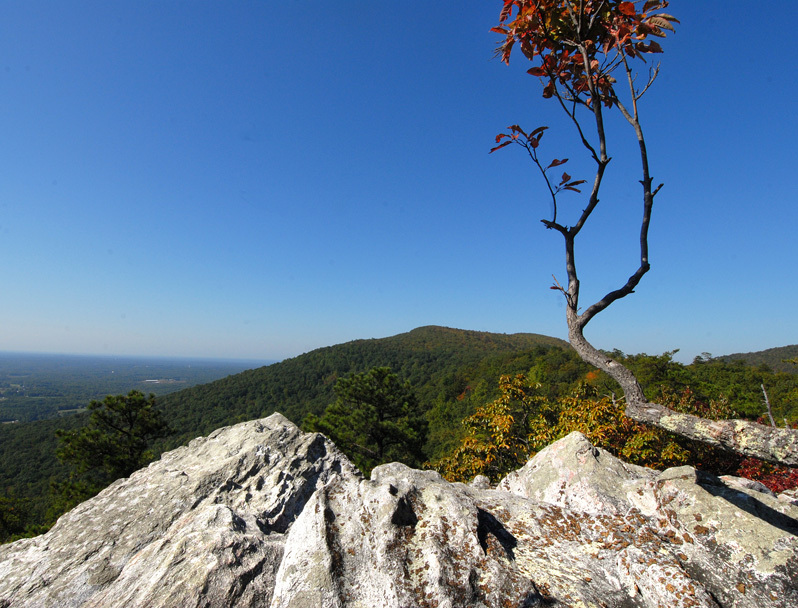 Wolf Rock is one of many spectacular overlooks at Hanging Rock State Park. Hanging Rock State Park in Stokes County was selected as the North Carolina 2012 Park of the Year by the N.C. Division of Parks and Recreation. The park was chosen for its “exemplary contribution to the North Carolina state parks mission of stewardship, public service and education.” Specifically, it was recognized for initiatives in environmental education, volunteerism and sustainability. The park was presented a coveted hiking staff when the award was announced at a recent park superintendent’s conference. A medallion will be added to the staff – which is passed to the superlative park each year – and it will be displayed in Hanging Rock’s visitor center. “Hanging Rock State Park exceeded expectations during 2012 with hard work by its staff tackling tough projects, developing volunteers and improving sustainability,” said Lewis Ledford, state parks director. “That level of commitment allows the state parks system to further its mission despite strained budgets and attendance that remains at record levels. In an annual report to administrators, Hanging Rock catalogued its achievements during 2012. The park rebuilt and improved educational displays, presented nearly 200 interpretive programs and staged a popular 75th anniversary celebration with 93 past and current employees. The park strengthened a relationship with the Friends of Sauratown Mountains support group, and volunteer hours spent improving trails and staffing the visitor center increased 58 percent. Park rangers and maintenance staff rerouted some trails, constructed a key trail bridge and nearly doubled the amount of recycled materials collected. The state parks system began choosing a Park of the Year in 2010 with one nomination from each of four districts. Each of 35 state parks and four state recreation areas submits an annual report that is objectively scored on progress in recreation, natural resource protection, sustainability, public safety and environmental education. Final judging is by senior and peer administrators. South Mountains State Park won the honor in its first year, and Lake Waccamaw State Park was honored in 2011. Hanging Rock was developed by the Civilian Conservation Corps in the 1930s and is among North Carolina’s oldest state parks. Its staff was under the direction of Superintendent Dave Cook until late 2012 when Cook was named north district superintendent. The park encompasses 7,049 acres and reported 443,899 visitors in 2012.